What Comes With My Bike Rental? Each of our bike rentals includes the following items at no additional cost. Route maps. Visit our ride planning center. Choose from our many options below to make your Sonoran Desert cycling experience unforgettable. No cost when combined with an AOA bike rental. Please call for a quote if renting a bike rack only. Trunk racks are not compatible with some cars with large spoilers or rear-mounted spare tires. All of our bike rentals include standard flat pedals, however, our bike shop is happy to install your own pedals on any AOA rental bike free of charge. We also offer a variety of pedal options should you need a pair. We stock one pair of Bontrager Race Lite aero bars which we will happily install and remove for an additional fee of $10 upon request and pending availability. Customers wishing to install their own aero bars on AOA rental bikes are responsible for checking compatibility (bar/clamp diameter, etc) on the bike manufacturers website or the “Specs” tab for each bike type on our website. They will be subject to a $10 installation fee. $18 per hour; one hour minimum. If you’ve checked out our Ride Planning Center and haven’t seen a route to suit you, ask our staff if they can provide you with alternative suggestions or we happily provide custom route design for a fee. Includes .gpx file for your Garmin device or ours of a route to suit your mileage, start and end location(s), elevation change, waypoints. We require the details of your desired route at least one week in advance. Our bike shop staff is always on hand to answer questions and help direct you to the best trails and road routes to suit your skill level. In the AOA bike rental shop we have bike accessories available for purchase including AOA branded gear such as bike kits, down jackets, t-shirts, and hats, as well as nutrition for your ride such as clif bars, gu gels, Nuun tablets, and more. 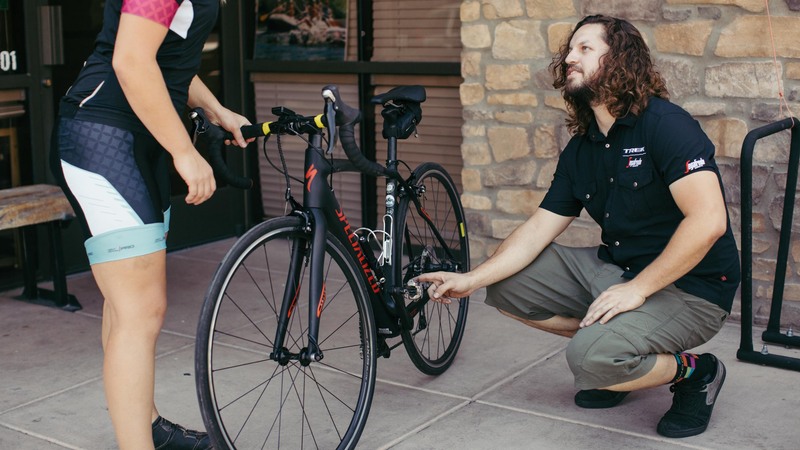 Our bike shop is happy to make minor adjustments to your rental bike should you need a certain fit. 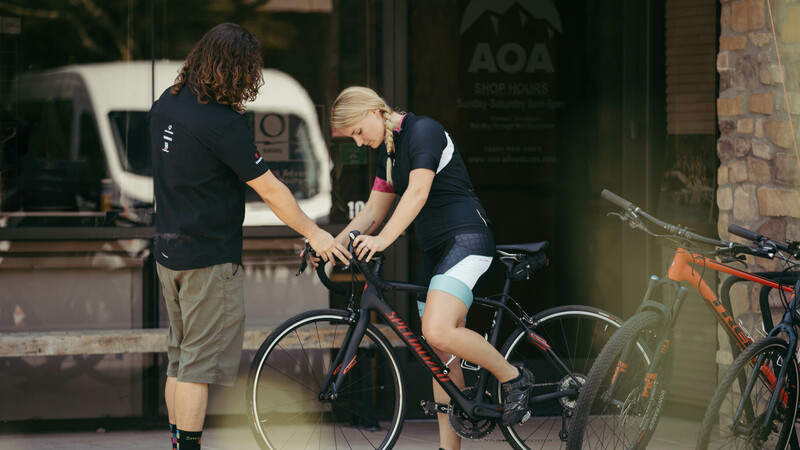 Please email us at info@aoa-adventures.com or call us at 480.945.2881 with your desired measurements and we will do our best to accommodate your needs and have you on a great fitting rental bike! Ready for a ride but not sure which bike to choose? Head over to our How to Choose a Bike page to find the best bike for the riding experience you’re looking to have.